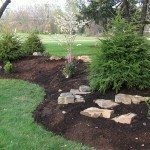 We just bought a house with lots of lawn and the desire to transform lawn into more interesting landscape features. We have some good fill dirt from creating egress windows in our basement, so we thought this would make good berm material. My question -- is it necessary to remove the sod before creating the berm or can we just pile material on top?